Posted: March 29, 2015 4:45 p.m. Updated: March 29, 2015 4:45 p.m.
Duke's Matt Jones (13) celebrates after the second half of an NCAA Tournament regional final game against Gonzaga on Sunday in Houston. 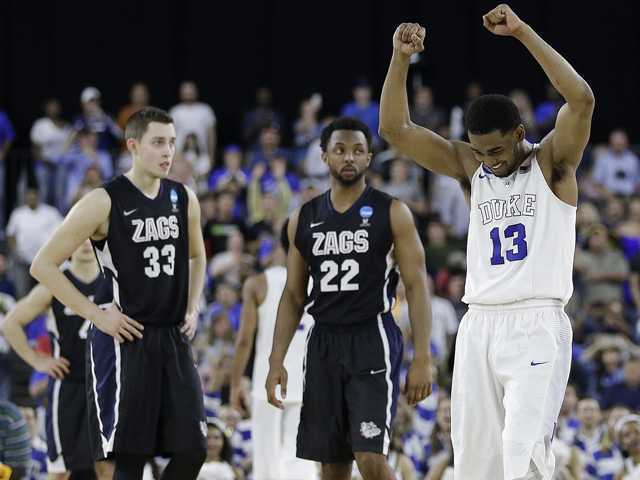 HOUSTON (AP) — Duke is headed to Final Four after a 66-52 victory over Gonzaga in the South Regional on Sunday. It will be the Blue Devils' 16th appearance in the Final Four and 12th under coach Mike Krzyzewski, matching the all-time record of UCLA's John Wooden. Justise Winslow had 16 points, including a big 3-pointer in the closing minutes, Matt Jones had 16 points, Tyus Jones had 15, and Jahlil Okafor added nine points and eight rebounds. Duke (33-4), the No. 1 seed, is going to Indianapolis to play seventh-seeded Michigan State in the Final Four. The other national semifinal game Saturday matches undefeated Kentucky and Wisconsin. The young Blue Devils responded with nine straight points and never trailed again. Kyle Wiltjer had 16 points for Gonzaga. SYRACUSE, N.Y. (AP) — Senior guard Travis Trice scored 17 points and the seventh-seeded Spartans clamped down on defense to advance to their ninth Final Four, seven under coach Tom Izzo. The Spartans (28-11), who were nearly counted out of the tournament conversation in February, won for the 12th time in 15 games. It's a run that included them knocking off second-seeded Virginia last weekend and third-seeded Oklahoma in the regional semifinal on Friday. Michigan State advances to face Duke, the South Regional champion. Wayne Blackshear had 28 points for the Cardinals (27-9). The Spartans rallied from a 40-32 halftime deficit to eventually build a 61-59 lead with 3:57 left, when Trice hit two free throws. The Cardinals rallied and had a chance to pull out the victory in regulation. Down 65-64, Mangok Mathiang hit one of two free throws with 4.9 seconds left. Michigan State took control in overtime, starting with Bryn Forbes hitting a 3-pointer 26 seconds in. After hitting 17 of 32 attempts in the first half, Louisville managed to make six of its final 32.